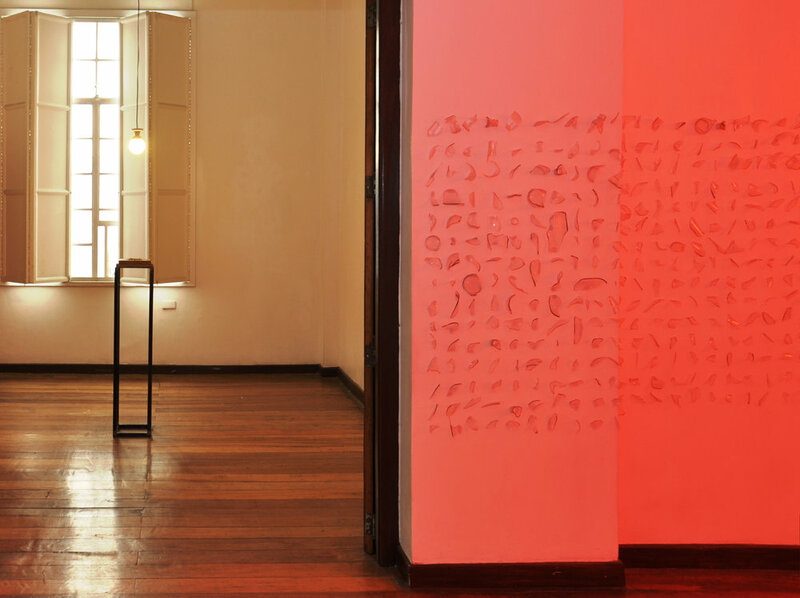 Referencing a phrase employed in police forensics, Arrays of Evidence gathers three installation projects by Kiri Dalena which operate as intersecting investigations into several trajectories of current unrest. The gallery foyer houses Dalena’s continuous work on slogans, documented through archival photographs of post-war to present demonstrations, as found texts of protest. 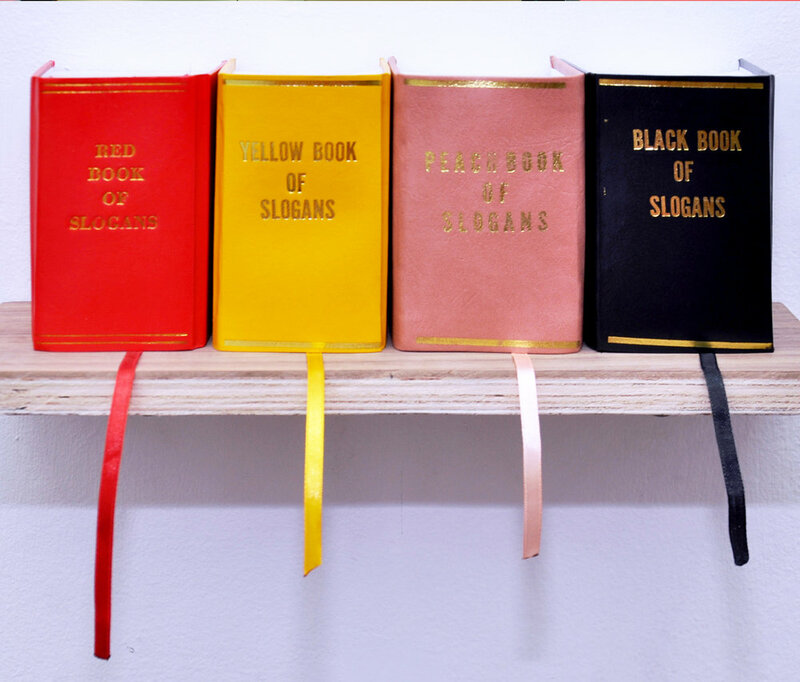 Originating from the Red Book of Slogans (2008) which contained texts from demonstrations through the 1950s to the First Quarter Storm of 1970, Dalena has since then compiled into a series of books, containing texts accumulated during protest actions under various Presidential administrations, from Pres. Gloria Macapagal-Arroyo to Pres. Benigno Aquino III and Pres. Rodrigo Duterte. The two other projects can be read as expressions of disquiet over the sunfolding extermination of society’s most dispossessed of sectors. In White Walls (2017), Dalena and other artists from the multidisciplinary alliance RESBAK (Respond and Break the Silence Against the Killings) gather pieces of clear broken glass from cemeteries and other places. The ensuing accumulation of over 6,000 shards, laid out across empty space, is a reference to the continuously growing number of people killed under the current administration’s war on drugs. Each piece stands for someone, broken and rendered anonymous in the quick succession of bodies on the street. Standing as counterpoint or counterpart to this is the work After Mebuyan (2016), comprised of 635 pieces of gold fashioned into rice grains. Dalena draws out parallel elements between Philippine mythology and peasant unrest: reflecting on how the multiple-breasted goddess of the underworld pounds on rice which then serves as both portent and proclamation of death. The harvest of grains, a symbol of life and sustenance, stands in contrast to the number 635, which corresponds to the number of Filipino peasants and farmers killed or assassinated in the past 15 years in the course of asserting their rights to land and food. In the numbers of grain and glass and in the accumulation of slogans, Dalena attempts to convey the immensity and scale of impunity of both past and present. The three projects, pursued separately in the past months, now converge as iterations of historical investigation: tallying the numbers of the dead as well as cries and shouts of outrage and dissent resounding through the decades. But it is in these gestures of remembering that one learns vital lessons from history itself: how the unrest of the times prefaces and opens, in journalist Pete Lacaba’s account, the floodgates to a thousand nights of rage.